Gravesites of William and Harvey Morris with their wives, they are buried near parents, grandparents, and siblings in Watertown Cemetery. 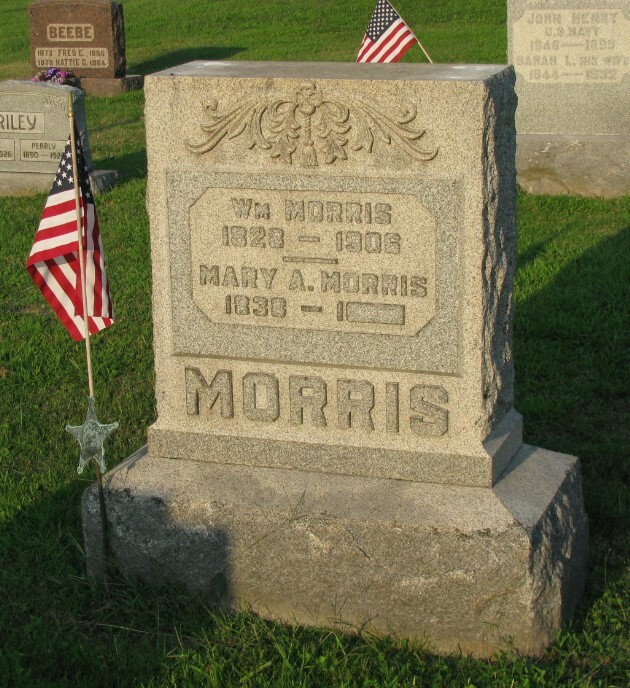 Harvey and William Morris were born in 1842 and 1828 respectively to John Morris, Sr. and Delilah (Biggins) Morris in Watertown, Washington County, Ohio. The brothers had siblings: William, John, Nancy, Tamar, twins Elza and Elwood, and Minerva. The family resided in Watertown, and many of them are buried there at Watertown Cemetery. Brothers John, Elza, and Elwood volunteered for service with the 77th OVI. Twin brothers Elza and Elwood did not survive the war, as they both succumbed to disease within a month of each other in 1862. John served until 1866, and was also a POW at Camp Ford in Tyler, TX during his long service in the war. 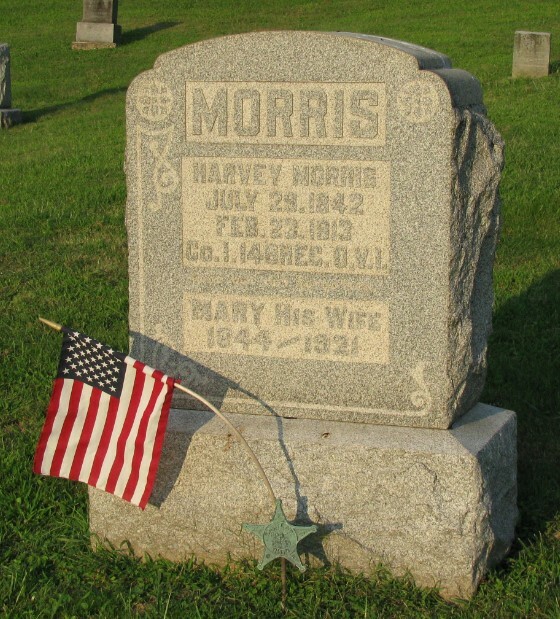 The oldest and youngest of the Morris brothers volunteered for Union service with the 148th OVI, along with their brother-in-law Henry Smith. Harvey was a brother-in-law with Henry Smith in two ways. Henry married Harvey’s sister Tamar, and Harvey had married Henry’s sister Mary. Note, William married the former Mary Wilcoxen. Harvey was a Comrade of Barlow GAR Post No. 434 in Barlow in Washington County, OH. William passed away in 1906, and Harvey passed away in 1914. Both are buried in Watertown Cemetery.